Very Rev. J. Michael Clark grew up in Murray, KY and attended St. Leo parish. He is the oldest of five children. He has one sister and three brothers. He went to seminary at St. Meinrad, where he received an M.A. in Religion and Philosophy and an M.Div. He was ordained a priest on May 27, 1995 -- the feast day of his Confirmation saint, St. Augustine of Canterbury. 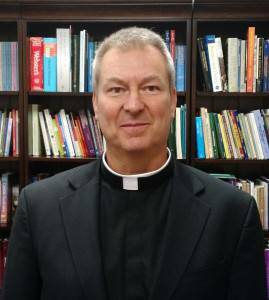 He was formerly the Parochial Vicar at St. Frances de Sales and Rosary Chapel (Paducah, KY) from 1995-'97, the Pastor of St. Jude (Clinton, KY), St. Edward (Fulton, KY) and Sacred Heart (Hickman, KY) from 1997-'01, and the Pastor at St. Anthony (Utica, KY) from 2002-'14. He became the Pastor at Blessed Mother on June 10, 2014. What he likes most about being a priest is celebrating the sacraments and interacting with people, especially as they strive to live their faith. In his spare time (what little he has!) he likes to cook, garden (herbs, flowers, vegetables), read (both fiction and nonfiction), travel, and learn about different cultures and history. He also enjoys kayaking, water skiing, horseback riding, tennis, and racquetball. His favorite books from Scripture are Baruch and Psa 30, especially the alliteration of vs. 12, where it says, "So my soul sings psalms to you unceasingly."